In this article we will look at different frontend layouts and views of Book Library, Joomla solution for eLibrary. In Joomla eLibrary solution two layouts for displaying All Authors are available: default (with names and A–Z index) or photo layout (with names, photos of authors and A–Z index). It can improve search rankings of your online book collection or library website. In Components -> Book Library -> Settings Frontend you can set Width and Height of Author photo size and specify Authors on the page (number of book per page). HINT: While creation a menu entry, don't forget to check tab Params to set layout and some other options for menu entry. There is one default layout for All Categories at the moment, but in Params you can set layout of single category. So after user clicks on some category in All Categories layout, he will enter Single category with default or list layout (as you set it). Comes from the menu entry name you created for Book Library. The image of the book can be found in the directory /components/com_booklibrary/images/. The file is called book.png and can be replaced with a different image if you like, just call it book.png and place in that directory. The categories created for your books show here, together with the number of books in them. If you have set Show Subcategory to YES in Components -> Book Library -> Settings Frontend, then subcategories are also shown. Remember: Categories will only show up in the frontend if there are books inside it and those books are published! When Custom Category images is set to NO in Settings Frontend you will see these default folder icons in the categories. When you set that to YES, then each category will show the image here which you specify in the Category itself (through category edit in the backend). HINT: The optimum size for category images is 48x48px. Search field will be shown if option Show search field is set to YES in Components -> Book Library -> Settings Frontend. Advanced Search button will show up if option Show advanced search is set to YES in Settings Frontend. Remember: When you apply these options, the changes will also touch Single Category layout. The buttons will show up if Show button Suggest Book, Show owners list, Show Add book button, Show button [Show My Books] is set to YES in Components -> Book Library -> Settings Frontend. 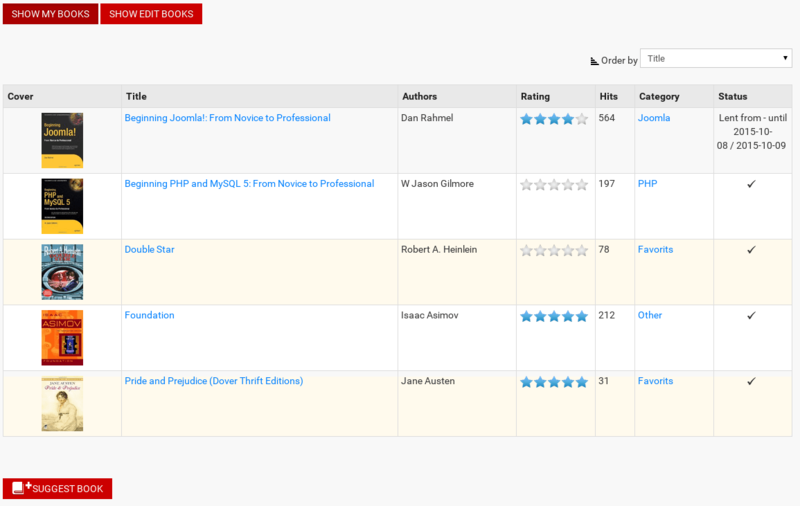 It allows the user groups you specified to enter book suggestions for inclusion in your library, view the list of owners, add book from frontend and view the user's books. RSS will be shown and activated if Show RSS in Components -> Book Library -> Settings Frontend is set to YES. Choose default or list layout for All Books menu entry. 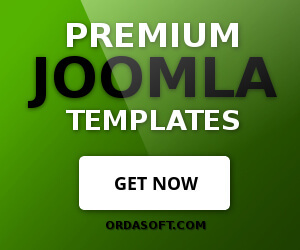 A layout can be chosen in Params while creating menu entry. In Components -> Book Library -> Settings Frontend you can set Width and Height of Book cover size and specify Page items (number of book per page). 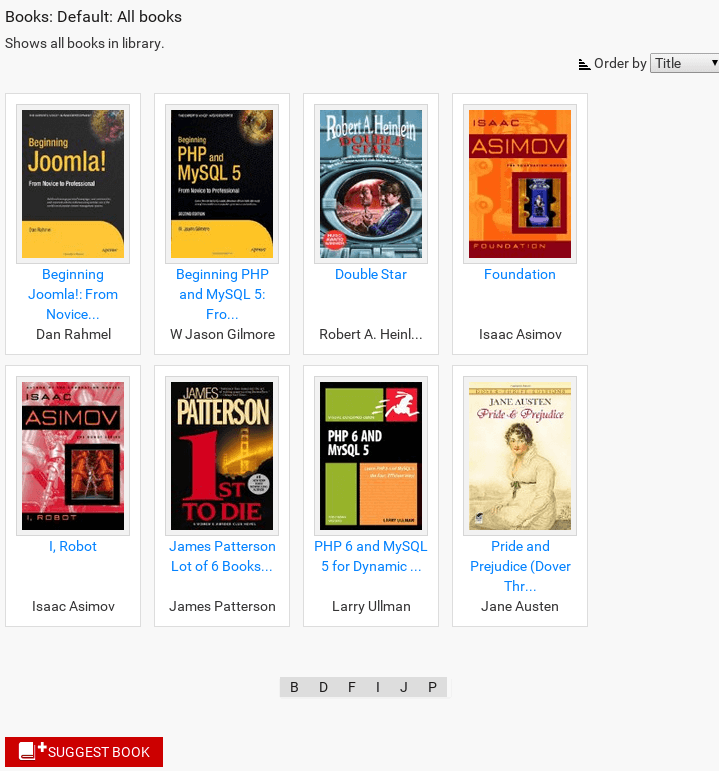 My books layout allows to view and edit books from frontend. It is possible to add/delete books,publish/unpublish books, lent/return from lent books. 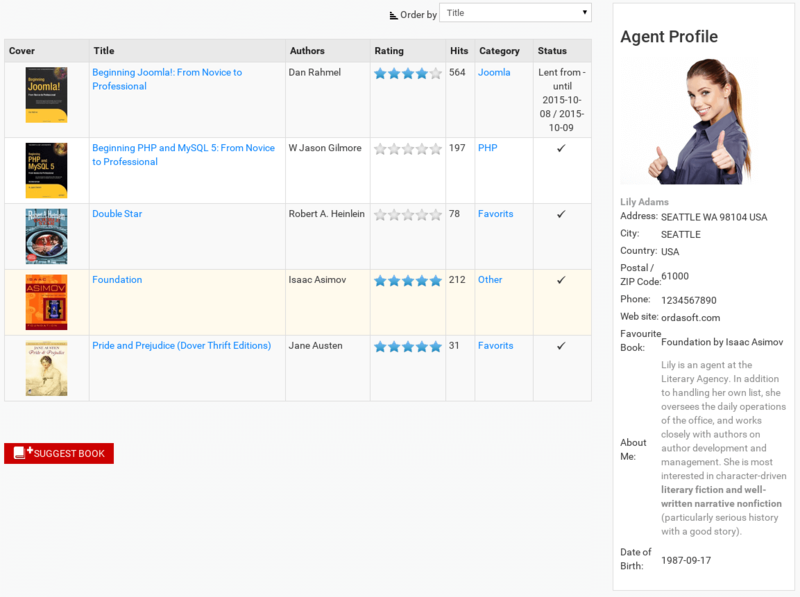 Owners List layout helps to display list of book owners in the frontend. 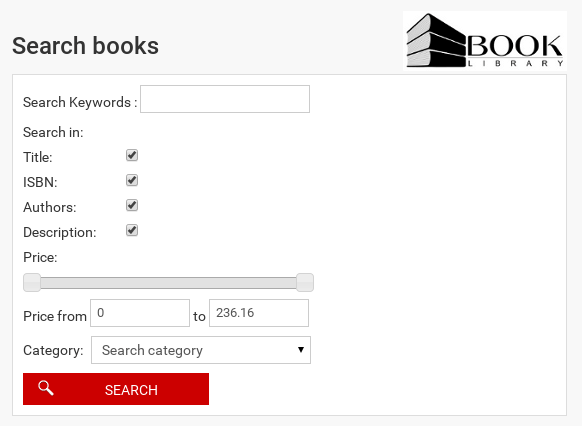 Search layout allows to search books by keywords (in title, ISBN, authors and description), price and category. Default or List layout can be chosen for Single Category in Params while creating menu entry. Remember: All changes that are applying for Single Category also will be applied to All Categories Layout. These icons will be visible if options Show button [print PDF], Show button [print View], Show button [send Link] is set to YES in Components -> Book Library -> Settings Frontend. The buttons will show up if Show button Suggest Book, Show Add book button is set to YES in Components -> Book Library -> Settings Frontend. 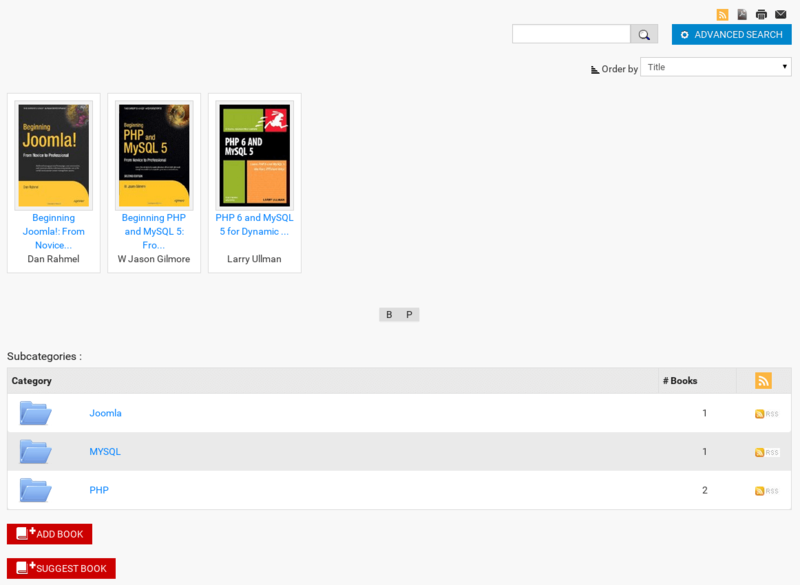 It allows the user groups you specified there to enter book suggestions or add new book from frontend. 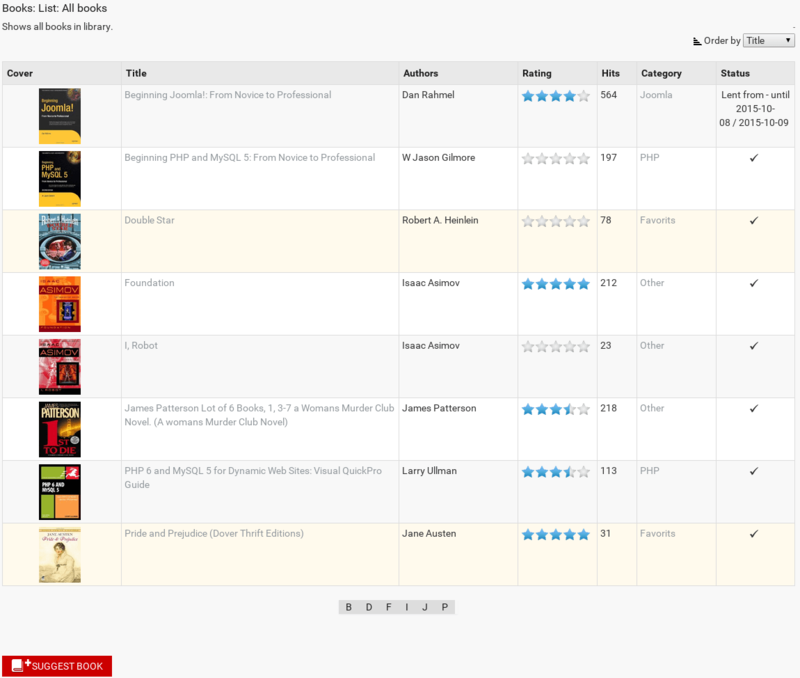 Single User Books layout helps to display books of selected user. User can be selected for this menu entry in Params. 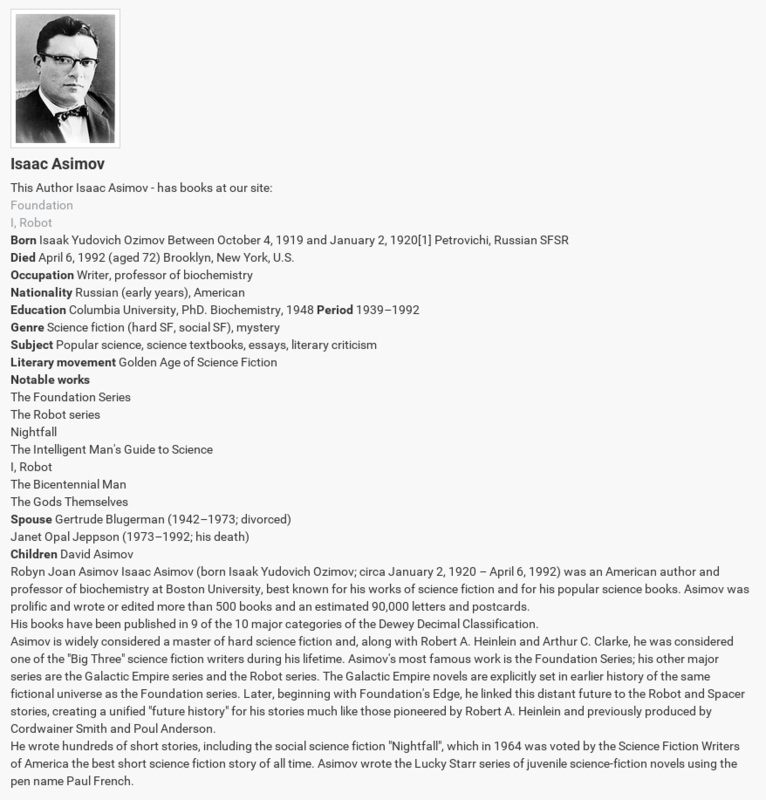 This shows all book details and the book cover, retrieved from Amazon by ISBN or entered manually in Edit Book in the Book in the backend. The Buy Now button shows up when you have enabled this option in Settings Frontend. You can decide there for which categories you want to show this button. You can select multiple categories by using CTRL + click in Settings Frontend. When enabled, the button shows an internal Joomla link, which when clicked changes to the Amazon page for the book, with your Amazon Associates affiliate ID in it. This protects the affiliate link from showing when hovering over the button. 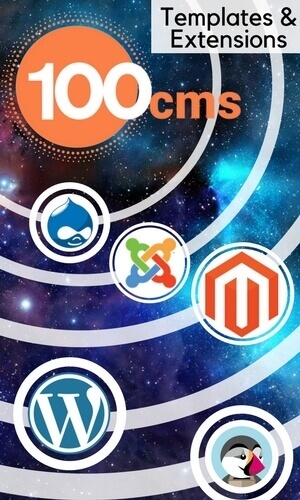 The affiliate link is also hidden from download managers. If you want, you can change the button by replacing the image file, called buy_now.png. It can be found in the directory /components/com_booklibrary/images/amazon/. The button is added using the Book Library cart module. Shows Book Library buying cart and displays the products that you intend to buy. In Settings Frontend can be set whether Show ebooks download link or not. Different formats are possible: epub, fb2, txt, pdf and so on. You can allow needed formats by yourself using option Format File Settings in Settings Frontend. To show license after clicking link to download, set option Show ebook download license to YES. This field will show from when until when the book is lent out. Only if you have enabled Show Lend Status for the frontend of course. 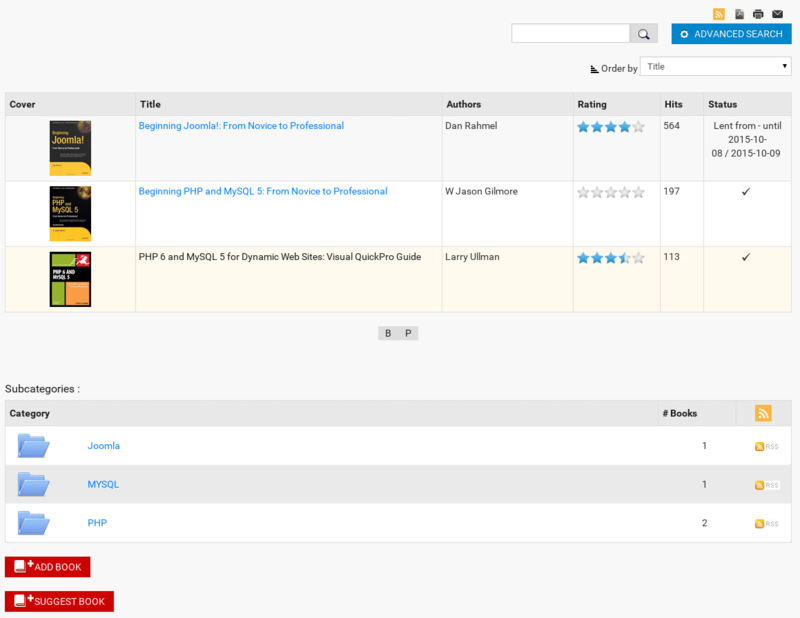 This shows the book description entered in Edit Book in the Book Manager in the backend. This can either be retrieved from amazon.com automatically (only works reliably from amazon.com, for copyright reasons!) or entered manually. Once edited, please remember to set the books Fetch Information from: field to "On your own" in the backend. This will prevent further overwrites through Information Fetching. In the Book Library Shop book descriptions, the use of external plugins is allowed and provided for. You can for example use the SUS Amazon plugin on your site to set additional links to other Amazon sites in the book description. Or use any other external plugin for that matter. Set Show owner in Settings Frontend to YES if you want to display it on the View Book layout. This button will provide your users with the ability to submit lend requests for the book listed in this detail page by pressing the Lend Request button. 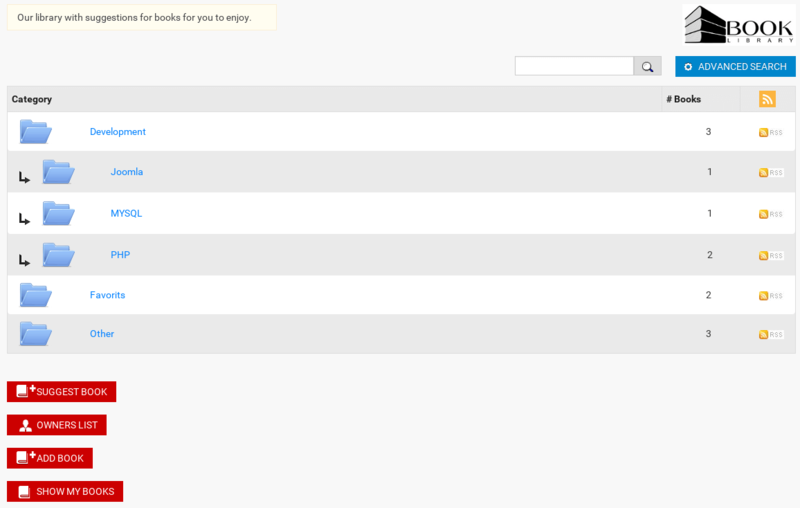 In Settings Frontend you can set the rights to determine who is allowed to submit Lend Requests for books on your site. You can select multiple user groups in Settings Frontend by using CTRL + click. 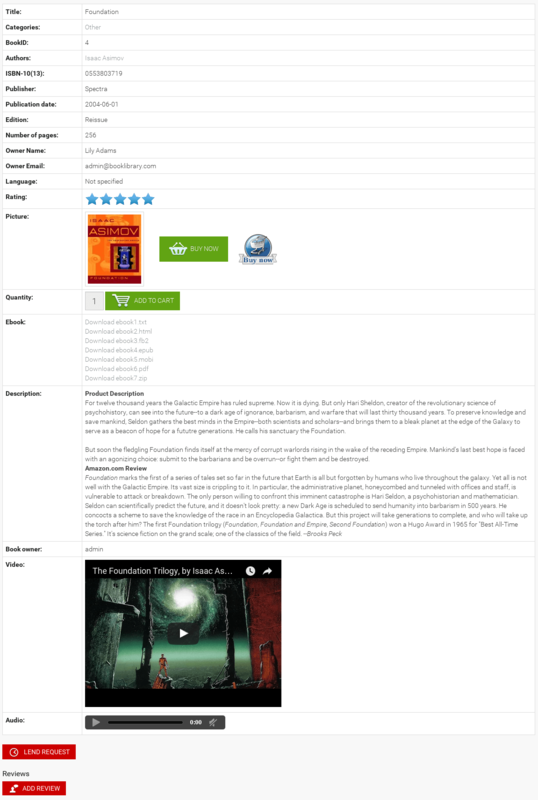 This button provides your users with the ability to add a review or comment about the book shown. Only if you have set the option Show Reviews in Settings Frontend of course, and only for the user groups which you have set to allow this option to. If also enabled for Guest users, then the form will be accompanied by a CAPTCHA screen as an anti-spam measure. In Settings Frontend you can select multiple user groups by selecting CTRL + click.